The necessary equipment/tools involved in plastering works are listed below. Before commencing the plastering works, required civil and MEP works shall be completed in accordance with approved drawings. Approved plaster accessories shall be used as required. Necessary staging with working platform shall be made to proceed with plastering/rendering works. The area shall be cleaned after finishing the plaster activities maintaining free of surplus material at all times. The plaster/render work shall be completed in accordance with manufacturer’s recommendations. Any suitable location can be designated by the COMPANY for the construction of Mock Up, prior to start the actual work in order to obtain final approval. Approved mock-up may remain as part of the completed work. All dust, loose particles, oil and grease from the surface shall be removed. The area to be rendered (block work surface) shall be dampened with clean potable water to neutralize the suction of the background. Spray sufficient amount of clean portable water to concrete surface to neutralize the suction of the background. Allow the free water to evaporate completely before the application of PLAXIT 114. The fixing of all attachments such as pipe, electrical fittings, etc. will be carried out before key/rush coat is start. The gap of conduits, if any, will be filled with cement, sand mortar mixed with approved bonding agent if required. The dabs of the plaster mortar shall be fixed to the required thickness as applicable. In the event of dissimilar backgrounds, a wire mesh as approved shall be fixed across the joint to resist the formation of cracks due to differential movement of the backgrounds. Mix one bag of 50 kg material with 11 liters of clean potable water. The mixing should be done with a suitable electric stirrer. Mix thoroughly and leave the mixed material for 5-10 minutes to completely dissolve the chemical additives. Before the application stir the mix again without adding any extra quantity of water. Material which has begun to hardening should not be used. PLAXIT 114 must be applied using a spray hopper or continuous spray machine. Spray the material in a continuous operation over the prepared surface in 2-3 mm thickness, in order to get a rough textured surface. After curing it with water for 48-72 hours (4-5 times a day), the surface becomes ready to receive further coats of plaster/render. Remove all the dust, loose particles, oil and grease from the surface to be rendered or plastered. Spray sufficient amount of clean potable water to neutralize the suction of the background. Allow the free water to evaporate completely before the application of the cement render PLAXIT 154. The fixing of all attachments such as pipe, electrical fittings, corner beads etc. must be completed before the rendering begins. The gap of conduits must be filled with cement sand mortar. In order to maintain the straightness of the plastered surface, the surface condition of the block wall/concrete shall be examined before plastering and dabs of the plaster mortar shall be fixed accordingly to maintain the straightness and minimum thickness level of the final plaster/render. In the event of the dissimilar backgrounds, approved G.I/wire mesh shall be fixed across the joint to resist the formation of cracks due to differential movement of the backgrounds. When applied with plastering machine, the water is manually adjusted with the flow meter to get wet mix of spray able consistency. But in case of manual application when required, mix one bag of 50 kg material with 7.0 liters of clean potable water. Mixing should be done using a suitable electrical stirrer. Material which has begun to harden should not be used. After application of PLAXIT 114 as a key coat on concrete surfaces and curing it at least for 2 days, apply PLAXIT 154 to the required average thickness of maximum 15-20 mm. Cure the plaster/render with clean potable water for a period of 3 days with 4-5 times a day. For internal use, PLAXIT 154 can be applied to a thickness of 15-20 mm on Normal concrete blocks, manually or with spray machine, after application of PLAXIT 114 as a key coat on concrete surfaces and curing it at least for 2 days. For plastering the concrete ceiling, first apply the key coat of PLAXIT 114 in 2-3 mm thickness to create a key for holding the plaster. Applied key coat must be cured with potable water for a period of 2 days. When the key coat becomes hard, PLAXIT 154 shall be applied on to it to a maximum thickness of 10 mm with plastering machine or by hand. Applied plaster must be leveled and finished with trowel to the desired finish. Final finishing of the plaster must always be done when it becomes thumb press hard. Finishing must be done with wooden float. Smooth finishing or the use of steel trowel during final finish must be avoided. Where the thickness of plaster/render is expected to exceed by 20mm, it must be applied in multiple coats with receding thickness. Each layer of plaster/render must be fully cured as per manufacturer’s recommendations, sufficiently hard and dry before going for the next layer on it. The base coat must also be sufficiently roughened to get the mechanical key for the next layer of plaster/render. Movement joints: A straight vertical joint should be formed in the plaster/render where shown on the drawings. Any anticipated movement should be accommodated by forming a straight joint right through the rendering line with the change of background. The resulting gap after drying should be filled with suitable joint filler/sealant. Plinth: On all kind of external surfaces the plastering/rendering must be started 15 cm above the soil level in order to prevent the upward migration of water/ salts due to capillary action of the render. For rendering the plinth a suitable high strength mortar must be used. The completed Plaster/ render work shall be water cured at least for 3 days after final finishing. The plaster/render must be well cured as per manufacturer’s recommendations and dried for at least two weeks before any painting is done on it. Any crack in plaster shall be repaired prior to proceed with painting works in accordance with method statement for painting works as approved. The decorative concrete effect cement plaster PLAXIT – 159, will be applied as per manufacturer’s recommendations. All the dust, loose particles, oil and grease from the surface to be rendered shall be removed. Spray sufficient amount of clean potable water to neutralize the suction of the background. Allow the free water to evaporate completely before the application of the cement render. The fixing of all attachments such as pipe, electrical fittings, corner beads etc. must be completed before the rendering is begun. For rendering the normal concrete surface, key coat PLAXIT 114 shall be applied to achieve mechanical key on concrete surface prior to rendering. Cure for the key coatis necessary 3-4 times a day for at least two days. In the event of dissimilar backgrounds fix a steel wire mesh across the joint to prevent the formation of cracks due to differential movement of the backgrounds. If the mixing is done by the machine the water flow is adjusted manually to get wet mix of spray able consistency, but in case of manual mixing, mix one bag of 40 kg rock plaster/render with 5.6 liter of clean potable water. Mixing should be done with the electrical stirrer. Rock plaster/render can be applied to a thickness up to 20 mm in one coat with spray machine. But where the thickness is expected to exceed 20mm it shall be applied in multiple coats. When applied in more than one coat it is important that the previous coat of plaster should be cured for at least two days and the surface must be scratched in order to receive the further coats of plaster firmly on it. Finishing of the plaster/render shall always be done with the wooden float to get a rough finish as per manufacturer recommendations. The plaster render should be kept moist by curing for at least three to four days with a gentle spray of water. The repair material will be applied as per manufacturer’s recommendations. The surface, on which PLAXIT 158 (RM) is to be applied, shall be cleaned of all residual mould oil, dust, loose particles and patches of efflorescence. In order to achieve adequate bonding, the suction of the background has to be neutralized by splashing clean water prior to application. PLAXIT – 158 (RM) should not be applied on over wet surface, which may otherwise lead to de-bonding and variation in colors of the final finish. Add 20 liters of clean water to 40 kg of bag. Water should always be placed into the mixing vessel before the addition of PLAXIT – 158 (RM). A mechanical mixer should be used to obtain a homogeneous mix. PLAXIT – 158 (RM) will be sprayed in 2 – 3 mm thickness on prepared surface with the help of spraying hopper. The PLAXIT – 158 (RM) will be cured for two to three days for 3 – 4 times a day, with a gentle spray of clean potable water. Dry pre mixed crack filler consists of white Portland cement, mineral fillers and chemical activities with elastomeric properties. Open the cracks of the plaster to 3 -4 mm wide with the help of the edge of the trowel or any other sharp edged tool. Remove the dust with the help of brush. Apply clean potable water to neutralize the suction of the plaster. Mix one bag of 30 kg material with 7.5 liter of water. Mixing should be done with electrical stirrer to a thick paste consistency. Allow the mix to stand for 5 – 10 minutes before application. 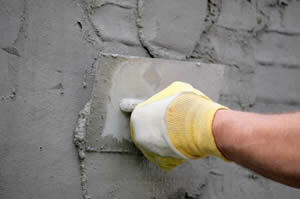 Apply the mix material on the crack with the help of a small trowel. Material should go inside the cracks only then it would remain effective to bridge the crack. Fill the cracks up to the plaster thickness and scrap the excess material with the trowel.